This stunning small feature tree, officially named Prunus 'Matsumae-fuki' but commonly known as 'Chocolate Ice', provides plenty of spring interest. In April-May, the large, showy flowers open blush white against the newly emerged red tinted, chocolate brown foliage, creating a bold and eye-catching contrast. The foliage will gradually fade to dark-green and then vivid shades of orange and red appear in the Autumn. Growing to just 4 x 4 metres in 20 years, Prunus Chocolate Ice is ideal for those with limited space. 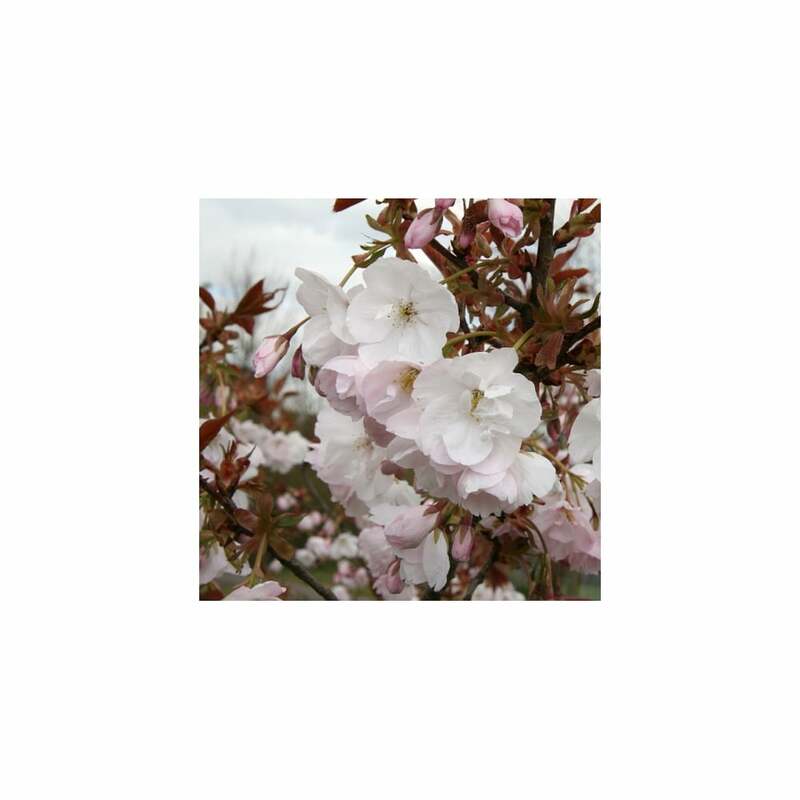 This flowering cherry tree is suited to most positions, including urban areas, as it is pollution tolerant but it is best to avoid very wet or chalky shallow soils. Our pot grown Chocolate Ice Flowering Cherry trees can be planted at any time of the year. Choosing a location away from strong winds protects the blossom display. Start by removing weeds and grass within a metre of your desired planting hole. Dig a square hole as deep as your root mass and approximately 1.5x as wide. To help the tree establish more effectively, sprinkle root grow in the hole. Remove the pot, gently loosen the roots and place into the planting hole. Mix 50% of the original soil with 50% compost, fill in the hole and firm around gently. Avoid banking the soil up around the collar of the tree. We recommend planting Chocolate IceCherry trees (except multi-stem forms) with a stake and tie kit to ensure the roots are well anchored - instructions are in the planting guide. When planting Cherry Blossom trees in spring or summer, water well for the first few months. Increase watering if there are extended periods of hot or dry weather. When planting in autumn, you may only need to water a little. See Irrigation kits. Although it is possible to leave your Chocolate Ice Flowering Cherry tree to its own devices, if you prune it for the first few years it will create a more balanced branch framework. Prune after flowering i.e. after the petals have dropped but before the new shoot growth appears. After two to three years, you will only need to remove any damaged or unwanted branches. The formative pruning previously carried out will have led to a healthier tree less likely to need this though.